To shift gears, press the clutch pedal down fully, select the desired gear with the gearshift lever, and release the clutch pedal slowly. 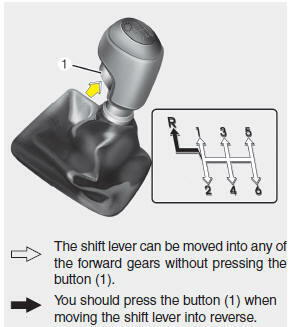 The shift lever must be returned to the neutral position before shifting into R (Reverse). The button (1) located at the bottom front of the shift knob must be pressed and held in while moving the shift lever to the R (Reverse) position. • To avoid premature clutch wear and damage, do not drive with your foot resting on the clutch pedal. Also, do not use the clutch to hold the vehicle stopped on an uphill grade, while waiting for a traffic light, etc.